Tchaikovsky’s Nutcracker and Rimsky-Korsakov’s Scheherazade are two well known staples of the orchestral repertoire. Both highly programmatic, they contain melodic ideas that are familiar to music lovers across the globe. 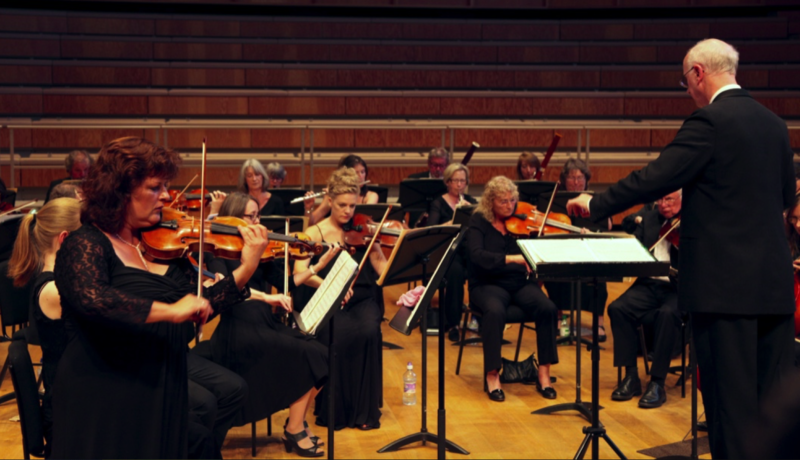 For an orchestra, presenting a programme of pieces that are firmly embedded within the classical music consciousness can be challenging, but Canterbury Orchestra demonstrated a flair for conjuring a fulfilling sound world. Act II from The Nutcracker depicts a dream sequence in which Clara travels with the Nutcracker Prince to the Land of Sweets, where a celebration of sweets takes place. The opening bars created instant magic due to the luxurious string melodic and expert woodwind flourishes. This rich and unctuous timbre was representative of the sweet things to come. As the celebration begins, the harp and celesta created a sense of childlike wonder, apt as the following sections (inspired by sweets) feature the talents of Dance Whitstable, who presented a series of dances that served to enhance the nature of the music. Each confectionary has it’s own character; Chocolate was completely charming and captured a South American flavour, due to the interplay between trumpet and clarinet. The skill of individual instrumentalists was further on display during Coffee with a beautiful sound created by both oboe and cor anglais. Dance Whitstable provided a lively dance to accompany Candy Canes, creating a vibrant atmosphere, and the younger members of the ensemble were showcased during Tea, to the delight of the packed auditorium. Waltz of the Flowers, possibly one of the most well known passages again featured the glorious harp, and a warm sound from the French horns. The piece ends with Clara and the ensemble dancing a final waltz, before flying away with her Prince in a reindeer drawn sleigh. The orchestra soared to a glorious tutti, before sailing effortlessly into the Apotheosis. This performance was a testament to both the orchestra, dancers and Andrew Lowen (conductor), as although the melodies are memorable, the pieces themselves are some of the most challenging. The second half of the concert continued with a programmatic theme, presenting three movements from Scheherazade (1888). Rimsky-Korsakov tells the story of a wife desperately trying to avoid execution at the hands of her husband, the Sultan. He is represented by a characteristic violin solo, which is woven throughout the piece. This was performed by the orchestra’s leader, Amanda Wyatt, who perfectly captured the expressive, yet menacing nature of this character. This solo was not conducted, showing a great deal of trust within the ensemble and allowing her to let her instrument sing. Other instrumental talents were also showcased, notably the bassoon’s bewitching melody during The Kalendar Prince, which was answered by a vibrant solo trombone fanfare. It is essential that ensemble allows it’s members to shine and this programme certainly afforded many opportunities. During The Young Prince and the Young Princess, the rubato strings supported a clarinet solo that was played effortlessly, portraying Arabic flourishes of Young Prince Ibrahim, falling in love with a portrait of his beloved. The strings further showed off their skills by using spiccato (a technique where the bow bounces off the strings) to create a more percussive effect. It is vitally important that a ‘programmatic programme’ takes the audience with the orchestra on a journey, and Canterbury Orchestra certainly did this during this concert. A variety of orchestra timbres were handled well, whilst allowing both soloists and dancers to take centre stage when required; as Tchaikovsky intended, a range of sweet delights.